A top Iranian official accused the Trump administration this week of violating the landmark nuclear deal as U.S. officials step up their efforts to combat Iran's support for terrorists and its illicit ballistic missile program, according to sources who spoke to the Washington Free Beacon about the matter. 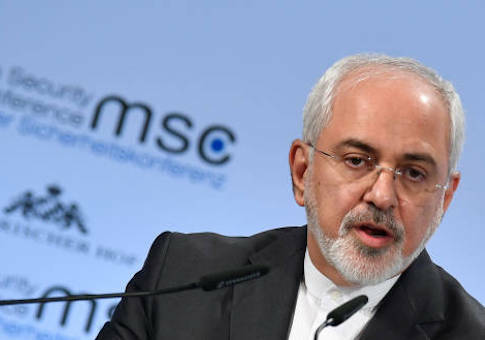 Iranian Foreign Minister Javad Zarif, one of the original negotiators of the nuclear deal, lashed out at the Trump administration and claimed the United States is violating the accord by not helping the Islamic Republic gain access to international trade and cash windfalls. Tehran says the Trump administration's new efforts to stop international governments and companies from doing business with Iran violates statutes of the deal guaranteeing the United States would help Iran increase its global economic power. The escalating confrontation is raising new questions about what the Obama administration promised Iran during sensitive negotiations leading up to the nuclear agreement, according to sources close to the Trump administration who said the U.S. Congress must increase efforts to obtain details of these agreements. While top Obama administration officials, including former Secretary of State John Kerry, made overtures to foreign governments on behalf of Iran, urging them to do business with the Islamic Republic, the Trump administration has been working to reverse course. White House National Security Adviser H.R. McMaster delivered a speech in Munich last week outlining the administration's new efforts to stop foreign governments and companies from investing in Iran, which remains the globe's foremost sponsor of terrorism. Iran also has the largest stock of ballistic missiles in the region, flaunting international laws banning such military hardware. In a speech before NATO allies at the Munich Security Conference last week, McMaster urged nations to stop doing business with Iran, specifically its commercial airline sector, which has been caught shipping weapons and militants to regional hotspots such as Syria. "What Iran is actually doing is applying the Hezbollah model to the greater Middle East," McMaster said. "They want the Arab world perpetually weak, and [they want] weak governments in power that are dependent on Iran for support, while they grow terrorist organizations, militias, illegal arms groups outside that government's control that can turn against government if that government acts against Iranian interests." The Trump administration's new efforts to combat Iran's support for terror proxies and its growing ballistic missile program—which is being exported to Hezbollah and other terror groups—riled Iranian leaders and prompted accusations that the United States is in violation of the landmark accord. "Every statement that has been made by President Trump that he wants to undermine this deal is a violation of the same paradigm," Iranian Foreign Minister Zarif said in response to McMaster's speech. "The U.S. is in violation of the deal, that doesn't mean the deal is broken." "Iran will respond" to these violations, Zarif said without naming specifics. "We will respond seriously" if the deal is broken. "I believe President Trump has tried to walk away from that deal from day one of his presidency and he has done everything in bad faith to prevent Iran from enjoying the benefits of this deal already," Zarif said. "So we believe the U.S. is already in violation. They need to respect the obligations of the United State government" under the Obama administration. U.S. efforts to isolate Iran and combat its growing military intervention in the Middle East have failed, according to Zarif. Zarif also issued threats to Israel following a recent confrontation between the Jewish state and an Iranian drone. The Iranian leader mocked Israel's fighting forces and promised a response if Israel decides to attack Iran and its terror proxies such as Hezbollah. "The myth of the invincibility of the Israeli military has crumbled and now they're trying to repair that," Zarif said. "If they try to exercise that threat they will see the response." One veteran foreign policy adviser who works closely with the White House on Iran strategy told the Free Beacon that McMaster's recent speech was meant to show Iran that the days of Obama-era appeasement have ended. McMaster's speech in Munich put muscle behind what President Trump has been saying since last year, which is that the era of America enabling Iran's bad behavior is over, said the source, who was not authorized to discuss the strategy on record. "The Obama administration did everything possible to grow the Iranian economy during and after nuclear talks, even as the Iranians expanded their terrorism and ballistic missile development." Potential side deals made by the Obama administration and Iran could complicate efforts to further isolate Iran and warrant investigation by Congress, the source said. "President Trump said that's over and McMaster's speech made that real to the Europeans. The only problem is that Iran seems to think new economic pressure violates implicit understandings and side deals," the source explained. "Congress should demand answers from former Obama officials to see what they actually promised." This entry was posted in National Security and tagged Iran, Iran Nuclear Deal, Sanctions, Trump Administration. Bookmark the permalink.